We’d love your help. 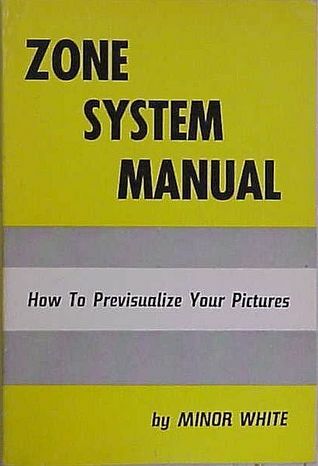 Let us know what’s wrong with this preview of The New Zone System Manual by Minor White. Published October 1st 1990 by Morgan & Morgan Inc.,U.S. To ask other readers questions about The New Zone System Manual, please sign up. I only just started into this book & so will reserve final judgement until I have finished it, but am enjoying it so far and find it still applicable today. Here are a few initial impressions, after having read the preface & first two chapters, which I shared with the person who gave it to me (to whom I both owe thanks for the example they set for me through their own interest in photography, and later in life, for encouraging me to develop my own talents). A word of explanation about my I only just started into this book & so will reserve final judgement until I have finished it, but am enjoying it so far and find it still applicable today. Here are a few initial impressions, after having read the preface & first two chapters, which I shared with the person who gave it to me (to whom I both owe thanks for the example they set for me through their own interest in photography, and later in life, for encouraging me to develop my own talents). A word of explanation about my correspondent is in order for the first point: they astoundingly managed to produce excellent photos in spite of suffering from aphantasia, a condition not widely known about at the time, and still very little understood! First, given what you know now about being unable to picture things in your head, what a frustrating book this must have been! For example, I can't imagine what you did with "Previsualization ... is to superimpose an imagined image in the mind onto an image held in the eye-brain". Second, his use of the passive voice makes it seem condescending. Was that a popular style of the day? Indeed, it's more than just a tone problem. Statements like this are hard to take seriously: "There is a difference in the penetrating power of an image made in a burst of naive enthusiasm and those made in a flash of trained intuition. The first is adolescent, the latter mature and sometimes wise." While I do appreciate the wisdom the author is trying to impart and am keeping an open mind, it does not paint a flattering picture of those who do not use a "system" of any kind in their approach to their art! I wish he would acknowledge more explicitly the value of untrained intuition, as he works on bringing me up to a higher level of my art through a more systematic approach. And third, while the concepts still are applicable today, I would (cheekily) say that perhaps the author failed to previsualize a future in which constraints he takes for granted would be lifted: "Since he dislikes yellow ... he has only to paint the house purple ... To make a corresponding color change in a photographic rendering is impossible in Black & White, and difficult in color printing. The medium of photography, as do all media, has limitations. ... No matter what kind of film or light-sensitive printing paper, to previsualize as one chooses one has only to learn the nature of the materials whether that be roll film, sheet film, Color, Black & White, Polaroid, prints, transparencies or whatever will be invented in years to come." Well, I can't judge him too harshly for that. Who, in that decade, could've imagined the ease with which we can now alter photographs with readily available free software in almost limitless ways? And yes, even so, my digital medium still has its limitations*. But it certainly poses a challenge to previsualize all of the outcomes in the moment of decision while the photograph is being taken and then choose one** to take. Challenging, yes, but not impossible. I look forward to reading more and will endeavour to read past his tone & translate these ideas into something useful in my practice of digital photography with the tools I have at my disposal today. Thanks so much for the book! * Such as the tradeoffs of cost/size/complexity of setup of a DSLR camera to get higher quality shots vs. convenience of a point-and-shoot to be able take more photos during an outing. Those same limitations would've existed in the day. And now, as then, no amount of tinkering in post will truly restore blown regions of the photograph, though I have seen (and tried, with limited success) some interesting techniques to remediate such faults.